Please read all directions because they differ from other photopolymer processing methods. Processing Puretch is easy and simple. By following all of the steps and tips given here you should achieve foolproof results. Instructions were updated Feb 2014, All Rights Reserved ©. Puretch is the thinnest photopolymer film available. It is a biodegradable, aqueous developing, negative working resist ideal for high resolution positives producing a durable resist that can be etched. It is no longer necessary to pre-thin the resist for etching fine halftones. Pre-thinning photopolymer film exposes the emulsion to oxygen, degrading it and leaving it less sensitive to UV light and yielding unpredictable results. After etching with Puretch, the resist can be stripped and the plate can be further re-worked with other traditional, non-photographic plate working methods. PREPARING THE PLATE A clean plate is VERY important for adhesion and all traces of cleaners or brighteners must be removed. If plate is dull dirty or oxidized, mechanically clean with a metal polish first. Next, clean and degrease the plate with solution of TSP until the plate rinses grease free with a solid sheet of water. Dissolve 1 part TSP in about 5-6 parts warm water in a wide mouth container. Use a thick nylon paint brush dipped in the TSP and work this over the surface of the recently polished plate. Rinse in cold water and repeat the degreasing with TSP if the water does not sheet. Thoroughly rinse this in cold tap water and dry with paper towels. Laminate resist immediately to avoid oxidation of the plate. Note: It is not necessary to abrade plates for adhering Puretch, a smooth finish is preferred as it does not refract light or trap excess moisture. LAMINATION 1. In a room lit with a yellow (bug) light, cut a piece of film larger than the plate or image. If the artwork is a small portion of the plate, a piece just bigger than the art can be cut. The film can be tacked down, dull side up, at the corners on a bulletin board or Homasote. Tack the film down first, then trim it to size. Tip: Unroll film with roll parallel to your shoulders, not perpendicular to you. This will help in lying film down later. 2. The film is sandwiched between two layers of protective mylar. Remove the dull mylar by scraping at the surface near a corner with one of the tacks. Re-tack that corner and with the film still tacked down, peel the liner away, tearing it out from under the tacks and discard it. 3. With a spray bottle of distilled water, mist the surface of your film evenly. Mist the plate liberally or simply remove it from the tray of distiled water and position it for lamination. Remove the tacks nearest to you and grab those corners. Pull wet film out from under the two other tacks. Bring film over to plate, with the plate hanging off the edge of table. Align bottom edge of film a little lower than edge of plate. Then lay the film on the moistened plate, try to let it lie down progressively leaving no bubbles. If there are wrinkles anywhere, lift film there quickly to remove them. Lift and move plate fully onto table top. Spray the top of the film lightly to lubricate the squeegee and squeegee from the center outwards in all directions, light pressure first, then firm. From the top side, trim edges of film with a sharp blade. Squeegee more if necessary. The squeegee water method is the best way to avoid bubbles and wrinkles during lamination. Tip: Keep your squeegee table very clean to avoid contaminates from seeping under edge of film, contaminates can cause film not to adhere at edges of plate during developing. 4. Heating the film evenly is the quickest way to get a good adhesion and remove the moisture from the film. Without heating the plate and film you would have to wait hours for it to dry on it’s own before exposing your plate. Copper quickly conducts heat so you can do this any number of ways. You can use a space heater fan in a drying cabinet (recommended), a hair dryer at close range, or hot plate on low for 1-2 minutes (180-200ºF). Larger plates will require slightly longer heating times than smaller plates. Example: an 8x10" plate will require 5-6 minutes with a hair dryer on high heat at close range. Prop plate up on spacers so table will not absorb all the heat. With a drying cabinet and electric space heater fan heating times can range from 5-15 minutes depending on plate size and wattage. Rotate plate for even heating. Overheating with any method will cause small bubbles and pinholes to form. FYI The photo circuit board industry wet laminates the film with a hot roll laminator at 250ºF at 2-5 feet/minute and the plate exiting the laminator at around 150-160ºF. Plates will not dry properly if the relative humidity is over 70%. 65%RH or lower is recommended in order to get good adhesion. TIP: If you have several plates to laminate, it is very convenient to laminate them all at once, let the film set up over night in a dark room with 65% or less RH. This method does not require heating. Plates can be exposed within a week if stored in total darkness. It is best to lay plates flat for drying, un-stacked as propping plates on edge can sometimes cause film de-lamination or contamination at that edge. EXPOSURE If you have a 21 step Stouffer transmission scale, the last visible step after developing should be somewhere between step 6-9 for normal line work, aim for step #4-5 (15 millijoules/sq.cm) for higher resolution halftone positives. After testing with the Stouffer you will have an ideal exposure time for your light unit. A vacuum frame is recommended for any high resolution image. Place halftone or art with ink or emulsion side toward the plate in vacuum frame. Expose plate with a UV point light source (mercury vapor, metal halide, arc, or sun - not fluorescent tubes). The distance of the light source should be at least 1.5 x the diagonal of the plate. Example: The NuArc N1000 with 1000 watt Mercury Vapor (light is 2’ from frame) will expose a Stouffer at step #5 in about 15-30 seconds. Light sources will vary. Puretch is a very fast exposing photopolymer. Note: It is best to establish exposure time first with the Stouffer then expose halftone step test and etch that for best etch times. If you don't have a Stouffer, etching and printing of the halftone step test is recommended to be absolutely sure of exposure. If small dots are not fully developing out and etching, the exposure is probably too long. DEVELOPER The developer is an aqueous solution of 1% sodium carbonate. Weigh 10g of soda ash and dissolve in a small amount of hot water, then add room temperature water to make 1 Litre. OR using a liquid medicine measurer, 1 1/8 fluid oz. of powder will make 1 gallon of developer. A tub of 100% sodium carbonate or soda ash can be bought at a swimming pool supply store very cheaply. It is best to use fresh developer or discard developer after using 2-3 times. Filter the developer through a paper towel before returning it to the bottle. Tip: You can check for complete development by brushing over the resist with some very diluted ferric. If you don't see the metal oxidizing then the developer has not yet penetrated the resist or the plate may be overexposed. TRAY DEVELOPMENT Wear rubber gloves to avoid getting dissolved photo chemicals on your skin. In a room with a bug light, pour room temperature developing solution in a tray. Carefully peel the protective mylar from one corner of plate, using a piece of tape to lift the corner. Make sure the mylar lifts without the resist. In one swift move, peel sheet from plate. If the plate was cleaned properly and heated to remove all moisture, it should remove easily, leaving the resist in place. If it does not, it may need longer heating times or humidity in studio may be too high. Place in developer immediately after exposure. Gently brush over the surface of the plate with a large soft watercolor brush to aid in removing unexposed resist. Plate should appear visually developed at about 35 seconds, develop 15-25 more seconds (about 60 seconds total), agitating tray, without the brush to remove resist residue. Rinse well with cool tap water. Blow dry with hot hair dryer. Excess water can be blotted with a clean sheet of newsprint before blow drying. SPRAY DEVELOPMENT Spray development (at 30 psi.) is the industrial method and yields sharper edges of resist than tray developing. A breathing mask is recommended with a high pressure sprayer to avoid breathing developer and undeveloped resist. The sprayer strips unexposed resist easier without abrading exposed resist. Fill sprayer with developer and pump to get full pressure. Set the nozzle to a smooth fan pattern. In a room with a bug light, carefully peel the protective mylar from one corner of plate, using a piece of tape to lift the corner. Make sure the mylar lifts without the resist. In one swift move, peel sheet from plate. If the plate was cleaned and dried properly, it should remove easily, leaving the resist in place. If it does not, it may need longer heating times or humidity in shop may be too high. Relative humidity should ideally be 60% or less and problems begin occurring at around 70%+ humidity. For large plates prop plate up in sink with a plexglass "backsplash", for smaller plates, lay flat in sink. Spray plate immediately after exposure, moving fan over entire image. You may spray at 5-10 second intervals, spraying at least half the total time. The image should develop at 60% of the total development time and the remaing 40% of time cleans the unexposed copper (about 50-60 seconds total). Rinse well (with a sprayer is preferred) with cool tap water. If tap water is soft (alkaline), rinse plate, then spray plate with a solution of water and distilled vinegar, 3:1 (to harden water and halt development) then rinse well. Most tap water is hard so this is usually not necessary. Quickly blot plate with paper towels and also blow dry with hot hair dryer. Advantages of the spray method are the developer is always fresh and ready, development is very visible and plates can be developed without having to deal with bulky trays. Different sprayers may vary, higher pressure sprayers will develop quicker, these times here work with small, inexpensive garden sprayers like the one pictured. CURING Harden the resist in sunlight or UV source until the resist turns a darker blue-purple. The plate is now ready for conventional etching in ferric chloride or other etchants. Ferric chloride is the preferred etchant for Puretch. ETCHING TIP Just prior to etching, pre-wet plate in the 1% soda ash developer. Rinse the developer in cold water, wipe excess water from the back of the plate and put the wet plate into the ferric. This pre-wetting will cause the etchant to begin biting evenly and help penetrate through any residual haze of resist. The Puretch can be bitten very deeply in ferric without breaking down. A half-toned photo resist can only be bitten almost as deeply as the dot resolution is wide as etch progresses downwards as well as sideways. Agitate halftones minimally about every 5 minutes to prevent undercutting. PROOFING The Puretch resist is durable enough to be printed once before stripping to determine if any more etching is required anywhere. Always use a water wash etching for this step so the copper can be cleaned thoroughly without harming the resist and the copper will still be receptive to the ferric. Use a brayer to ink and very soft tarleton to wipe. If more etching is required then wash ink out carefully with water and brighten copper in a dilute salt vinegar solution before etching. Keep in mind that the plate will print a tad bit darker with the resist in place than when it is stripped. STRIPPING Exposed resist can be stripped with the TSP degreasing solution. Paint this onto the resist with the nylon brush and wait about a minute for it to lift. Rinse plate and dry. SAFETY Puretch is a very safe resist when used properly. Discard all mylar cover films in the garbage. Use all materials at your own risk. 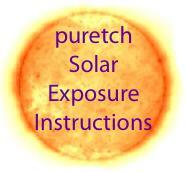 PURETCH SOLAR EXPOSING DIRECTIONS You can expose Puretch in the sun with excellent results. The sun is the ultimate UV point light and the rays are virtually parallel. Exposure is fast, free and easy. Please read all basic instructions first. Solar exposure is not recommended for very fine halftone work since contact is not as tight as with a glass vacuum exposure unit. It will still work with the proper exposure but there may be a loss of shadow detail in the lightest areas. It works very well however for line work or graphic work. See YouTube videos for other suggestions. THE POSITIVE A liquid is used to contact the positive to the surface of the film and plate for exposure. A glass contact frame can be used instead. There are three types of film positives that can be used for the wet contact method; inkjet, laser, Kodalith or imageset transparency. The Kodalith, imageset positive and laser copies will adhere with water and the inkjet will adhere with mineral spirits or CitraSolv concentrate. If you want to use a drawing you have made it is a good idea to make a digital transparency or laser copy of it so you will not damage the original or use the glass contact frame. Inkjets, Kodaliths or laser prints will not be damaged when the correct liquid is used. Laminate the Puretch to the plate as previously described in the basic instructions. Pour a small pool of the mineral spirits or CitraSolv on the middle of the plate directly onto the Puretch film (with top mylar still in place) or mist the surface lightly with water. Place the positive, ink side down on the plate then smooth positive in place with a dry paper towel making sure there is contact over the entire surface and no bubbles. Since edges of the positive have a slight tendency to lift it is a good idea to have a plate slightly larger than the image and trim after etching. Cover plate with one of the light proof materials above to transport outside and expose immediately thereafter. EXPOSURE It should be a sunny day and not overcast. You will have to make test exposures starting around 12 seconds, more and less. 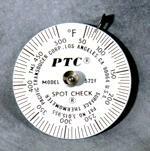 Periodic testing with a 21 step Stouffer is good for solar exposure (see basic instructions) because the exposure times will vary at different times of the year. Use distilled water for adhering the Stouffer. If you do a test in mid winter you should retest in midsummer and use these times as a gauge for the rest of the year. Hold plate perpendicular to the sun's rays for exposure. Remove cover for the desired time. Return plate to darkroom for normal developing. Remove the positive and wipe off any excess water or solvent with a paper towel. See basic instructions for developing film.